Did you know that out of about 4.000 hectares of flowers currently grown in Ecuador, about 2.500 are roses Ecuador is the first exporter of fresh cut roses in the world. Ecuador, a country known for its beautiful sceneries from the captivating Galapagos Islands to the mysterious Amazon Jungle and all its cities and villages in between has more in store for you than you would imagine. Within the last 10 years Ecuador has added a new attraction to its already full repertoire of sights to see: flower plantations. Did you know that out of about 4.000 hectares of flowers currently grown in Ecuador, about 2.500 are roses Ecuador is the first exporter of fresh cut roses in the world. Rose exportation is the fifth most important staple of Ecuadorian trade, which is why we have dedicated this tour to showing you just how beautiful Ecuador’s roses are. 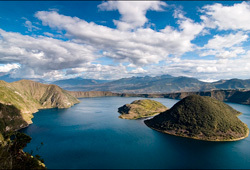 To begin this adventure private transportation will be provided for you that will take you from your hotel to Otavalo. During this visit you will experience the Otavalo Market, known for its indigenous artisan market 'La Plaza de los Ponchos'. There you will have the chance to view any and all the native-made goods from sweaters and hats to wood carvings and many other handcrafted artifacts. So that you get a better idea of what the Otavalo culture consists of you’ll be having lunch at Casa Matico. Located in Peguche just outside of Otavalo, this initiative led by the women of the community is a haven dedicated to the workmanship and creativity of the indigenous women. Casa Matico is a space dedicated to the women of Peguche where they can peacefully work on their crafts. There you will have the chance to enjoy a delicious traditional lunch and partake in the many cultural activities of this important initiative. After you’ve enjoyed your lunch and some activities within the community you’ll head towards Tumbaco. As you might know there are many legends surrounding some of the most astounding sights, mountains, and lakes that accompany us in our travels. Along the way from Otavalo to Tumbaco you’ll bear witness to the Imbabura hill and the San Pablo Lake and make sure to ask your guide about their legends. After this you will visit one of the most important rose plantations in Cayambe, here you will go on a guided tour of the premises. On the tour you’ll be able to take a closer look at what goes into the process of cultivating these beautiful flowers as well as the behind the scenes of the exportation and bouquet making processes. Afterwards you’ll be able to make a pit stop on your way back to Quito to enjoy some traditional sweets, our famous bizcochos. The day starts when our representative picks you from your hotel and takes you to the city of Otavalo where the market takes place and fills the city with amazing colors and aromas. After a captivating experience of bartering for handicrafts you will have a delicious lunch at Casa Matico. Casa Matico is a community project designed by the women of the Iluman community in order to incorporate their work into the economy. At casa Matico you can also be part of the creative process that goes into making their beautiful crafts. After this visit we will go the breathtaking Cuicocha volcano and its crystal clear waters which rest in the crater of this active volcano. Here you can take a boat ride inside the lagoon and get close to the small islands formed by the volcanic activity of years past. We will then head over towards Cotacachi. Cotacachi is well known for its leather industry holding within the city about 80 different leather shops. Once the visit is finished we will drive to one of the haciendas of Imababura where you will spend the night. On the second day of our visit you will be delighted with the best roses in the world at one of Tabacundo’s plantations. Here you will learn about the process on a guided tour of the premises. On the tour you’ll be able to take a closer look at what goes into cultivating these beautiful flowers as well as the behind the scenes of the exportation and bouquet making processes. Afterwards you’ll be able to make a pit stop on your way back to Quito to enjoy some traditional sweets, our famous bizcochos. After this visit we will go the breathtaking Cuicocha volcano and its crystal clear waters which rest in the crater of this active volcano. Here you can take a boat ride inside the lagoon and get close to the small islands formed by the volcanic activity of years past. We will then head over towards Cotacachi. Cotacachi is well known for its leather industry holding within the city about 80 different leather shops. Once the visit is finished we will drive to one of the haciendas of Imababura where you will spend the night. 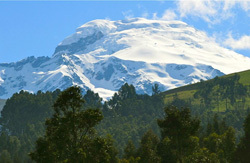 On the second day of our tour we will have a full day at the snow covered volcano Cayambe. This volcano is the third highest volcano in Ecuador and the equatorial lines crosses almost in the same point as the summit. The surrounding area of the volcano is part of a natural reserve that protects endangered species such as the spectacled bear. Here we will visit the first refuge and enjoy the magnificent view from the volcano. In the afternoon we will visit our next hosting place Molino San Juan an old mill and one of the first mills in the northern part of Ecuador. This hotel keeps in its interior all the pieces of the ancient mill and is also a captivating museum. On the third day of our visit you will be delighted with the best roses in the world at one of Tabacundo’s plantations. Here you will learn about the process on a guided tour of the premises. On the tour you’ll be able to take a closer look at what goes into cultivating these beautiful flowers as well as the behind the scenes of the exportation and bouquet making processes. Afterwards you’ll be able to make a pit stop on your way back to Quito to enjoy some traditional sweets, our famous bizcochos.